In the 2013 updated and expanded edition, a team of authors describe the education campaign that preceded Colorado voters legalizing marijuana in 2012. High and Dry, one campaign targeting college campuses steered students away from alcohol. SAFER (Safer Alternative For Enjoyable Recreation) was founded by co-author Mason Tvert. Not only does the US have the highest incarceration rate in the world, but also the highest number of all prisoners worldwide. At 5% of the world’s population, the US imprisons a fourth of the 10 million reported prisoners globally. Of 218 nations surveyed by the International Centre for Prison Studies, the US ranks No. 1, far and away jailing more of its citizens, by numbers and percentages, than China, which ranks 118. Not to be outdone, the US also incarcerates women at much higher rates than any other nation, and at any other time US history. Female incarceration rates jumped 64% from 1995 to 2006. For a longer view, in 1925, the US jailed one in 100,000 women; by 2006, it jailed one in 746. Most interesting about Holder’s announcement today is the timing. It followed last night’s airing of the documentary, Weed, an investigative report by TV doctor Sanjay Gupta who pre-empted the broadcast with an apology for his stance on marijuana. “I mistakenly believed the Drug Enforcement Agency listed marijuana as a Schedule 1 substance because of sound scientific proof,” he wrote. Schedule 1 drugs are considered extremely dangerous with no medical value. But, like medical marijuana advocates have been saying for years, that just ain’t so. Weed featured the story of six-year-old Charlotte Figi, who has a severe type of epilepsy known as Dravet syndrome. She suffered 300 seizures a week. Modern medicine was unable to help. The family finally pursued medical marijuana, the kind that’s high in CBD, the medicinal cannabinoid, and low in THC, the psychoactive one. She’s now down to seven seizures a week, and the results were immediate. Some of the documentary still fell short, though. Weed showed an increasing rate of treatment for marijuana ‘addicts’ over the past several years without mentioning that many of those (teen and adults) seek ‘treatment’ in lieu of jail time for possessing, using or selling a plant that has been around for 34 million years. Obama’s turnaround on marijuana didn’t come soon enough for the medical cannabis clinics in Washington last month. 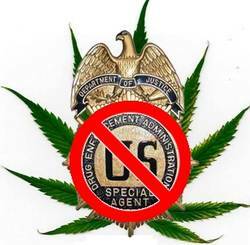 With guns drawn, on July 24 federal Drug Enforcement Administration agents stormed 18 legal medical marijuana clinics in three counties in Washington, seizing product, paperwork, employee cell phones, and other items. Two days later, federal jackboots seized the houseboat of one the women who runs one of the raided clinics. Madelaine Addy Norton, the office manager at Bayside Collective, posted a tearful video on Bayside’s Facebook page, after a phone call from the DEA advising they were about to seize her houseboat. She later removed the video, instead posting a comment confirming the seizure. “These raids constitute one of President Obama’s single biggest days of paramilitary action in the federal crackdown on medical cannabis patients and providers,” said medical marijuana activist, Mike Liszewski of marijuana patient advocacy group, Americans for Safe Access (ASA). A week later, Michigan clinics were raided, and two weeks later Los Angeles clinics were also raided by federal agents. That followed over 100 raids on LA clinics in June. In a landmark report, ASA estimated in 2012 that Obama had spent nearly $300 million in the past four years on aggressive enforcement practices in medical marijuana states. As with other civil liberties, he’s Bush on steroids. But Obama now plans to release several prisoners, Holder announced – those who are elderly and whose ‘crime’ did not involve violence. Hasan was sentenced to two life sentences without possibility of parole because she lived in her cousin’s house while he was selling drugs. That story makes the best case for pardon, which is in the president’s power to grant. If Obama really is reversing himself, these raids on legal medical marijuana clinics need to be left to state authorities who pursue only those who violate state laws on the growing and selling of marijuana. As of today, twenty states and the District of Columbia have legalized medical marijuana. This nearly reflects American attitudes toward pot, Marijuana is Safer explains: The Pew Research Center found in March 2013 that 52% favor complete legalization. With both Obama’s policy reversal and Gupta’s change of heart on weed, suspicions may be justified, especially with the development of genetically modified marijuana. Best to buy or grow your own from a trusted heirloom source, whether for recreation or medicinal purposes. You can help support the medical marijuana cause at RealmOfCaring.com, or by joining ASA’s Peace for Patients campaign. This entry was posted in Art, Books, Music & Film, Healthcare, Human Rights Civil Liberties, Obama and Company and tagged mandatory sentencing, marijuana, medical cannabis, obama, peace for patients, Prisons, realm of caring, sanjay gupta, weeds. Bookmark the permalink.